Fig. 1: Comparison of current results with a meta-analysis of 1140 medical trials and a recent study of 100 trials. Point estimates from our current sample of 158 drug trials and 87 nonsurgical, nondrug trials support previous estimates from the meta-analysis. 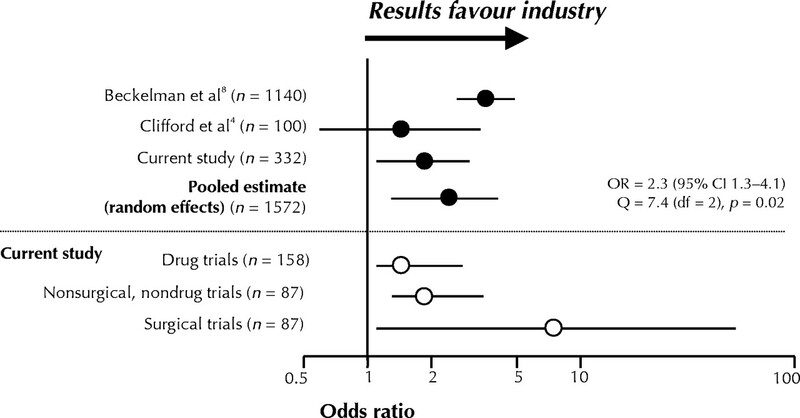 Point estimates of the odds of pro-industry conclusions from 87 surgical trials are greater than those of drug trials and nonsurgical, nondrug trials. OR = odds ratio, CI = confidence interval, Q = quotient, df = degrees of freedom. Randomized clinical trials: What gets published, and when? Is best interests a relevant decision making standard for enrolling non-capacitated subjects into clinical research? Accounting for uncertainty about investigator bias: disclosure is informative: How could disclosure of interests work better in medicine, epidemiology and public health? Symposium: Relationships with Industry: Critical for New Technology or an Unnecessary Evil?